My boys love angry birds. They love the video game, they have the board game, and they even have a stuffed red one that makes noises. So, it was inevitable that my son asked for Angry Bird Pizza for his birthday dinner. I thought and thought about how I could come up with this. I came up with using just a basic cheese pizza but I put the sauce on the TOP of the cheese instead of the bottom. My boys loved it and when I put it on my Facebook page it got a lot of comments. So without further ado, here is my tutorial on how to make your pizza look like a red angry bird. If you make this for your kids, they will think you are the coolest person ever. I promise. Roll out your pizza dough into a circle. You can make it as thin or as thick as you like. At the top, pinch two pieces of dough to stick up like the angry bird's feathers. Poke all over with a fork. (so it doesn't puff up). Sprinkle with cheese all over. Bake in oven for about 10 minutes or until the edges of the crust start to get a little golden. Remove from oven and place on wire rack to "decorate" your pizza. While your pizza crust is baking, cut out the cheese that you will need for the face. You will need 2 white circles for the eyes, a bunch of sliced olives for the eyebrows and the eyeballs, and some orange triangle cheddar cheese slices for the beak. 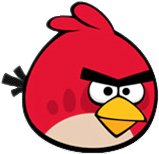 Here is the red angry bird for you to look at, just in case you need a reminder. You can put pizza sauce over the entire pizza and then cover the bottom triangle with more cheese, OR just leave the bottom triangle with just cheese and no sauce. I left it with no sauce because I didn't want any red peaking out. Arrange the facial pieces. Bake about 5 more minutes or until everything is completely melted and the crust is brown on the edges. I hope you and your kids have fun with this. If anyone can figure out how to do a blue bird, yellow bird or green pigs, let me know. I just couldn't think of anything that would be appetizing for those colors. (except maybe a Monterey jack cheddar blend might work for the yellow...)If your family likes black olives, I imagine that you could do the black bird. This is awesome, Jen! My kids would absolutely love this--thanks for a super cute idea! Andrew would flip for a pizza like this! LOVE it! My three year old saw this and requested we make it tonight. I think I will! Great idea! This is hilarious and so creative, great job! I'm sure any kid or fan would love this! This pizza is fantastic. I love making edible crafts and your tutorial for this project is great. I'm sure kids and adults would flip over this. Made this for dinner tonight at my kids' request! Very fun! Use basil pesto for the piggies. My 4 and 8 year old LOVE pesto pizza and are always disappointed when I use regular red sauce. I am going to surprise them with this pizza during the week. Awesome recipe thank you for sharing. I am going to make the Yellow Bird as a four cheese pizza with the sauce on the bottom, keeping the cheese rather thick so little or no red sauce comes out. Hi Jen! I think if you want to make a blue bird pizza, the best would be for it to be a dessert pizza (where you make the crust with flour and brown sugar and others ingredients that I forgot but you could probably find a recipe somewhere on the net!) This would allow you to use blue candy and/or blue decorating gel for your pizza...I hope this can inspire you! That is SUCH a cute idea!! Love it!! i don't how tasty this pizza is, but the the look is great... my kids loved them. Any ideas for making pizza for the rest of the birds?